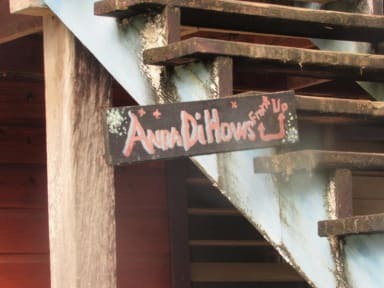 Anda Di Hows Hostel i Placencia, Belize: Bestill nå! Anda Di Hows Hostel offers a full kitchen for your use as well as coffee maker. Covered veranda area with hammocks and a bar where you can make your own drinks. Inside you can hang out at the curvy Rasta Bamboo bar. In the bathroom we have the famous bottle wall. Every bed gets it's own fan, free WiFi and lockers for your use. Being located in the center of the village, the bars, shops and restaurants are all close by as well as the tour operators and dive shops. We are walking distance from the Hokey Pokey Water Taxi as well as the bus stop. We are at the south end of the famous Placencia Sidewalk once know as the smallest main street in the world. In the dorm there's a round bar located in the center of the room with the bunk beds surrounding it. Each bed has it's own fan, pillow, blanket, sheets and towel. There is daily housekeeping. There's a covered veranda with hammocks for you relaxing pleasure. And you can cook up in our full kitchen with stove, oven, full sized refrigerator and all the pots and pans you need. We have a coffee maker for your use as well. 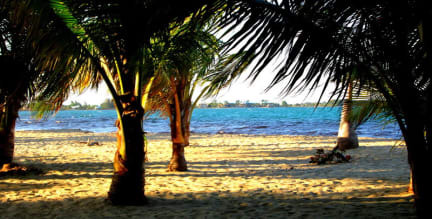 We accept cash only USD or Belize dollars. There's a ATM close by if you need credit card withdraw. There is no age restriction but remember it is dorm lodging only.